While everyone loves a cooler full of tasty food and cold drinks, not everyone loves having to carry a full, heavy cooler. That's where you and Promotion Pros can come to the rescue with a promotional rolling cooler imprinted with your company brand or logo! 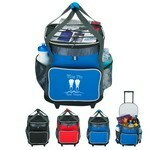 Be it a long trip, a picnic or any outdoor activity, keep your beverages nice and cold with the 18 Can Rolling Kooler. Embroider your company’s logo and tag line on the large imprint area, to get maximum exposure for your brand. 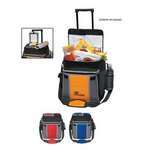 Be it a long trip, a picnic, or any outdoor activity, keep your beverages nice and cold with the 18 Can Rolling Kooler. Screen Print your company’s logo and tag line on the large imprint area, to get maximum exposure for your brand. 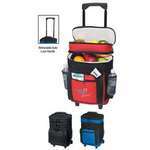 Keep your food and drinks chilled and unspoiled, with the bright and colorful 24 Can Rolling Kooler. Embroider your company’s logo and tag line on the large imprint area to get maximum exposure for your brand. 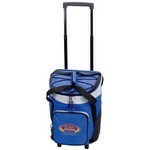 Keep your food and drinks chilled and unspoiled, with the bright and colorful 24 Can Rolling Kooler. Screen print your company’s logo and tag line on the large imprint area to get maximum exposure for your brand. The personalized 30 Can Camo Roller Cooler features inline skate wheels with molded protective feet. Our customized 30 Can Rolling Cooler features telescopic handles and heavy duty wheels. Take picnic and camping experiences to a whole new level, with your perfectly chilled beverages, using the trendy 30 Can Rolling Kooler. Embroider your company’s logo and tag line on the large imprint area, to get maximum exposure for your brand. Take picnic and camping experiences to a whole new level, with your perfectly chilled beverages, using the trendy 30 Can Rolling Kooler. Screen print your company’s logo and tag line on the large imprint area, to get maximum exposure for your brand. Promote your brand with this 36 Can Rolling Cooler, a roomy food and beverage storage solution. 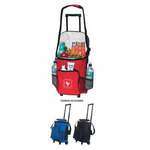 The Flip Flap Rolling Kooler is ideal to carry beverages in, whether you decide to have an outdoor party or a barbeque. Imprint your company’s logo on the bag, to boost your brand’s success.